Error in Left Front Cable Panel chart: Row 1, stitches 15-18 should be a 2/2 RC, not a 2/2 LC as charted. Right Front Cable Panel, Row 19 should read K1, p2, k4, p2, (2/2RPC, 2/2LPC) twice, p2, k4, p3, k8, p3. Right Back Cable Panel, Row 9 has “2.2RC” where it should be “2/2RC”. Left Back Cable Panel, Row 19 should read K2, p2, k4, p2, (2/2RPC, 2/2LPC) twice, p2, k4, p3, k8, p3. Left Front Cable Panel, Row 9 should read P3, k8, p3, 2/2RC, p2, k2, p4, 2/2RC, p4, k2, p2, 2/2RC, p2, k2. Set-Up Row (RS): *K2, p2, M1, k2, M1, p2, k2, M1p, p2, M1p, M1, k2, M1, M1p, p2, M1p, k2, p2, M1, k2, M1, p2, M1p, (k2, M1) twice, k2, M1p, p2; work Small Diamond Texture Stitch (SDTS) over the next 18-, 30, -, 42, -, 54 sts, M1, p2, k4 (slipping marker in between), p2, M1, work SDTS over the next 18-, 30, -, 42, -, 54 sts (starting with k2 instead of k3 because the M1 counts as the first k st), p2, M1p, (k2, M1) twice, k2, M1p, p2, M1, k2, M1, p2, k2, M1p, p2, 1p, M1, k2, M1, M1p, p2, M1p, k2, p2, M1, k2, M1, p2, k2, repeat from * for the second half of the sts, slipping markers as you come to them. 276-, 324, -, 372, -, 420 sts. Set-Up Row (RS): *K2, p2, M1, k2, M1, p2, k2, M1p, p2, M1p, M1, k2, M1, M1p, p2, M1p, k2, p2, M1, k2, M1, p2, M1p, (k2, M1) twice, k2, M1p, p2; work Small Diamond Texture Stitch (SDTS) over the next -24, -, 36, -, 48, - sts, k2tog, p2, k4 (slipping marker in between), p2, ssk, work SDTS over the next -24, -, 36, -, 48, - sts, (starting with k2 instead of k3 because the ssk counts as the first k st), p2, M1p,(k2, M1) twice, k2, M1p, p2, M1, k2, M1, p2, k2, M1p, p2, M1p, M1, k2, M1, M1p, p2, M1p, k2, p2, M1, k2, M1, p2, k2, repeat from * for the second half of the sts, slipping markers as you come to them. -300, -, 348, -, 396, - sts. On the instructions for Shape Right Front Neckline, it should read … With RS facing, decrease across the cable panel as follows: k2, p2, ssk, k2tog, p2, k2, (p2tog) twice, ssk, k2tog, (p2tog) twice, k2, p2, ssk, k2tog, p1, p2tog, ssk, k4, k2tog, p2tog, p1 (14 sts decreased); then finish rem sts with Wide Garter Rib. 4751, 53, 59, 64, 69, 75 sts. Seanair* is the Scottish Gaelic word for grandfather, a name I chose because the person I designed this for is a grandfather with a Celtic ancestry. 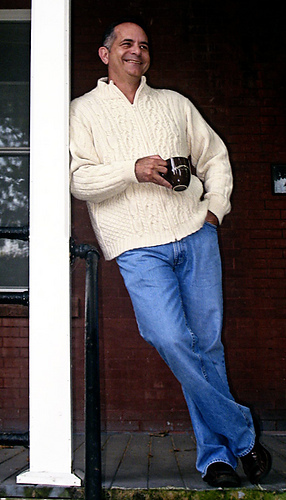 There is very little seaming in this cardigan. 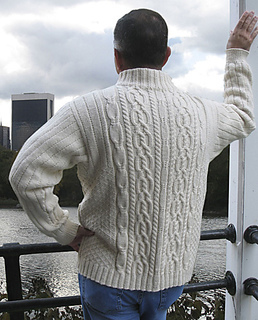 The body is knit in one long piece from side to side, then the upper back and upper fronts are finished separately. 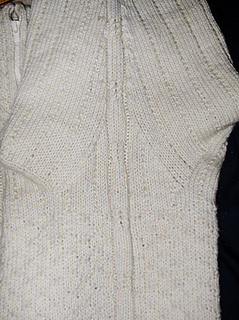 After the body is finished, the shoulders are joined with a 3-needle bind-off, the sleeves are picked up around the armhole opening, and the double collar is picked up around the neck edge. Only the zipper is sewn in. The design is mirrored around the body: The right front is reflected on a vertical axis to become the right back; the configuration is repeated on the back except that there whole piece is joined (instead of split for a zipper). 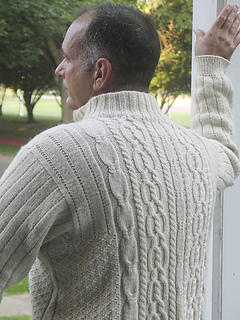 It could easily be made into a crew-neck pullover by joining the fronts and working twisted stitches into the center front (as is done in the back). Because it was designed as outerwear, I worked in an underarm gusset for a little more roominess. *Seanair is pronounced approximately as “Shen er” with the accent on the first syllable.